- SnugFit Drawstring at one end to pull the cover tight to the cot and keep it out of the wheels. - VersaPocket at one end for gloves, paperwork and other small equipment. - CleanEdge binding at lower edge to keep the cover clean as you roll it into and out of the removal vehicle. - Matching, lined pillowcase that fits a standard bed pillow that you provide. Lined with FluidBlocker, if the case is soiled, remove the pillow and throw the case in the washer and dryer. - All covers are washer- and dryer-safe. Of course, for best results, dryclean. Standard size cot covers are designed to fit regular cots, like the Ferno 23, 24, 27 and the Junkin MC-100A. Standard will also fits the 24-MiniMaxx. Sized just over 79 inches long, 23 inches wide and 11 inches deep, our covers are larger than the standard hi-luster & corduroy covers that have been popular for years. If you need a longer cover or one that's larger all over, please consider the PLUS- or TALL-sizing options. PLUS-sized covers are designed to fit the Ferno 24-Maxx and the Junkin MC-100A-OS. The PLUS is generously sized at 80 inches long, 26 inches wide and 13 inches deep. That allows more than 7 inches extra width across the widest part of your clients. TALL-sized covers are designed to fit the 24-MiniMaxx cover. The length (79 inches) and width (23 inches) are the same as the standard size, but the sides are all 5 inches taller so that the height (16 inches) helps cover larger individuals. 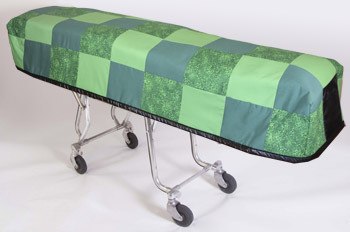 The PATRIOT Model Cot Cover, priced at $525, comes with a reversible Stars and Stripes lining. This cover functions as a normal Cot Cover in your choice of any of our fabrics, but can be reversed to show the patriotic fabric to honor a veteran. Due to the intricate construction and their popularity, please allow 4 to 6 weeks for construction and delivery. International orders may incur additional shipping.